Paper napkins come in so many attractive designs these days that they offer a wide range of decoupage possibilities. Here, we chose rosebud napkins to decoupage a bath set, but cheerful yellow ducks, green frogs, or colorful tropical fish would be just as charming. Use the jar to store homemade bath and beauty recipes. 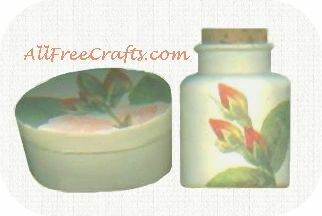 The paper mache or shaker box makes a pretty container for cotton balls, earrings, jewelery or hair barrettes. Clean the glass jar with rubbing alcohol or vinegar to help the paint adhere. If needed, lightly sand the shaker box and remove any sanding dust. Paint the shaker box and the glass jar in two coats of cream colored acrylic craft paint and let dry. Alternatively, paint with your choose of model car paint or glass paints. Use fine scissors to carefully cut out the designs you want from the paper napkins and do a “dry run”, experimenting with various positions until you find a design you like. Separate the napkin layers so that you’re working with only the one thin layer printed with the design. Paint clear coat on the decoupage area of the shaker box and jar. Carefully place on each decoupage element, smoothing gently to eliminate wrinkles. Finish with one or two layers of clear coat medium.